The ERM01 is a 4U 19(23)" concentrator rack type E1 DSU/CSU for Fractional and Unframed G.703 E1 Access for central office installations. There are 13 slots available for hot swappable G.703 E1 cards. An optional SNMP card can be installed into the last slot for configuration and management, leaving 12 slots available for G.703 cards. The SNMP card provides both local control via an RS-232 serial console port and remote IP management using Telnet or industry standard SNMP protocol. Each E1 card may be linked to a remote E1/FE1 stand-alone Access Unit for various LAN, Data, or hosts over E1 network services. The ERM01 accommodates an optional second hot swappable shared power supply module which may derive power from AC (90-250) or DC (-48V) power sources. On the rear panel, combinations of BNC, RJ-45 and wire-wrap terminals are utilized for E1 Line interface connections. Adapter cables are used to convert the HDB26F DCE data ports to V.35, RS-530, RS-449, X.21 or 10/100 Base Ethernet depending on the installed card. The ETU011 stand-alone DSU/CSU is a digital access unit for Unframed E1, Fractional E1, or Fractional cascaded E1 service. The ETU01 data channel supports user-selectable transmission rates via randomly selected E1 timeslots, which provides integral multiples of 64kbps, up to a maximum 2.048Mbps (unframed), for a line attenuation of up to 43 dB on twisted pair or coax cable. This provides an approximate operating range up to 2km (using 22AWG). The ETU01 packs the data channels into the E1 link in user-selected time slots. The unused time slots can insert IDLE code (in frame mode). The EOE1A is a Channel Service Unit for unframed ITU-T G.703 E1 that features a built-in Ethernet bridge. The CSU has a built-in Network Terminating Unit (NTU) and may connect to either 75 Ohm unbalanced, BNC connectors or to 120 Ohm balanced, unframed E1 via twisted pairs and a shielded RJ-45 connector. 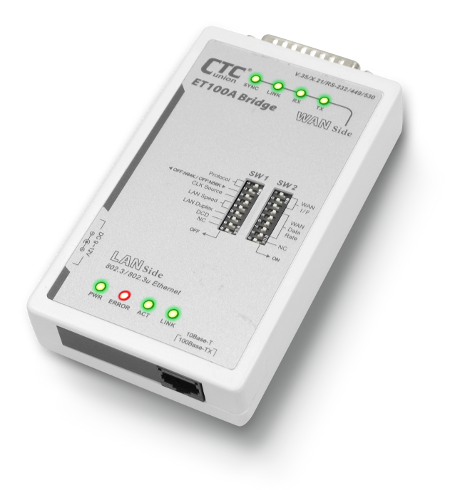 The EOE1-A Ethernet Bridge uses HDLC encapsulation to transport Ethernet packets across the WAN and supports 10/100 auto-negotiation or manual settings for 10M, 100M, Full or Half Duplex Ethernet. The Ethernet port also supports a standard auto-MDIX feature that will completely eliminate Ethernet cross-over cables or the guessing that is sometimes involved in choosing a cable when connecting to a HUB or a PC. The EOE1-A is very easy to configure by a menu driven serial console interface. SNMP and proprietary MIB add the ability to manage the EOE1-A centrally through third party network management software. The FRM220A-Eoe1 is an Ethernet over E1 bridge and is part of the FRM220 family of interface converters and fibre optic line drivers. The FRM220A-Eoe-1, when used in pairs, enables users to connect 2 Ethernet networks together over an E1/G.703 link. The LAN interface on the unit is presented as a single 10/100BaseTX RJ45 connector and the E1/G.703 interface is presented as either a pair of 75 ohm BNC connectors or a 120 ohm RJ45 connector. The FRM220A-Eoe-1 has the capability to be connected to both unframed 2.048Mbps E1 interfaces as well as fractional n x 64Kbps E1 services. The FRM220-E1/DATA slide in card DSU/CSU is a digital access unit for Unframed or Fractional E1 services. The FRM220-E1/DATA data channel supports user-selectable transmission rates via selected E1 timeslots, which provides integral multiples of 64kbps or 56kbps, up to a maximum 2.048Mbps (unframed), for a line attenuation of up to 43 dB on twisted pair or coax cable. This provides an approximate operating range up to 2km (using 22AWG). 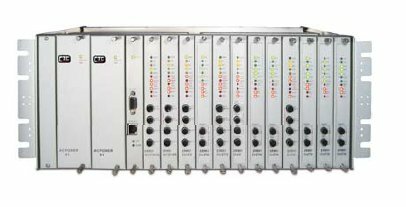 The FRM220-E1/DATA front panel provides status LEDs for monitoring the CSU and DSU conditions for initiating local and remote loopback with integral BERT. The FRM220-E1/DATA features a Data cable adapter for connection to industry standard routers. 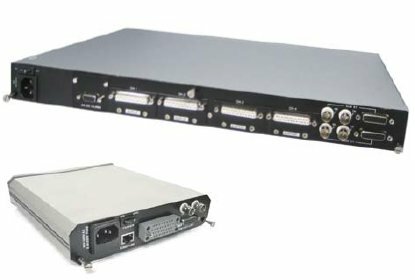 When the FRM220-E1/DATA card is Placed in the FRM220 rack with SNMP management, in-band management allows viewing the card and remote converter’s status, type, version, link status, data link status and alarms. Both card and remote can be configured to enable or disable the port, reset the port, set the data rate, modify the clock mode and initiate local or far end loop back test.